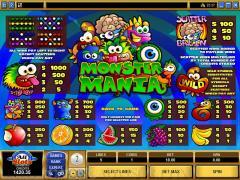 Monster Mania is a slot game that is based on exactly what you might expect, featuring five reels and nine paylines. It has a "wild," in addition to a scatter symbol, which carries the name of "Scatter Brain." The game is designed by Microgaming, which is the head honcho in the minds of many when it comes to online casino software. The "Scatter Brian" symbol does not have to appear on an enabled payline in order to be part of a win. Scatter wins are derived by multiplying the number of credits wagered by the Scatter Brain payout. 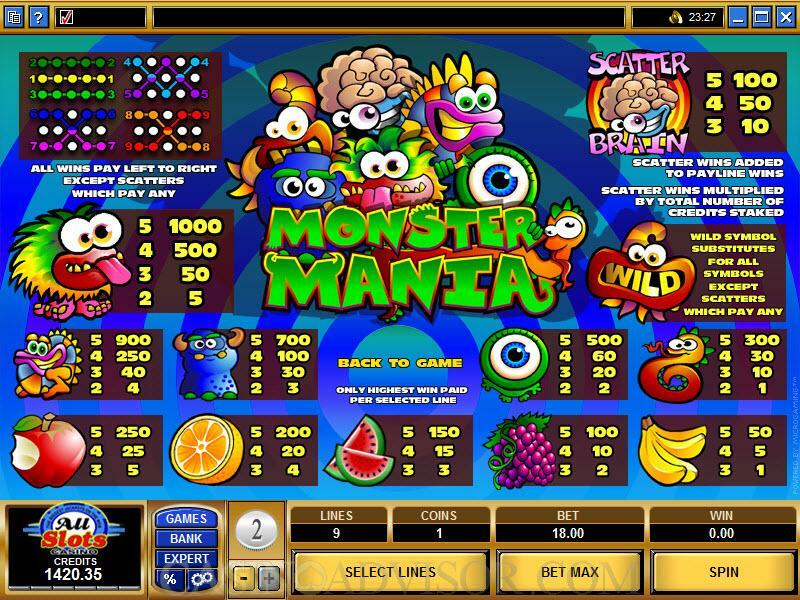 Monster Mania gets underway when you click the "spin" button, but prior to that you have the option of enabling as many paylines as you want and adjusting the coin size. 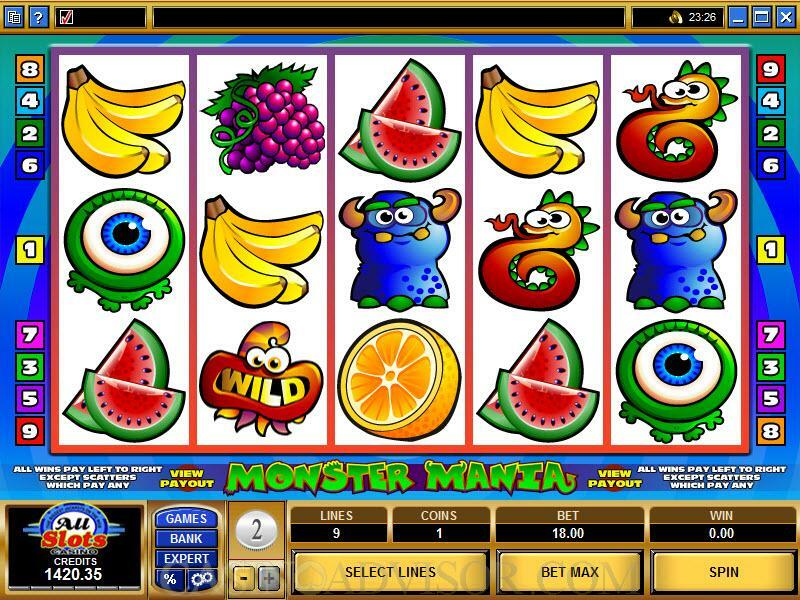 You can enable up to nine paylines before each spin. The coin denominations come in four sizes - .25, .50, 1.00 and 2.00. The coin size is adjusted by clicking on the minus (-) symbol or the plus (+) symbol to increase or decrease. It's very simple, but if you want a solution that is even simpler, you can select "Bet Max" and it will automatically generate a bet that is equal to the maximum amount for any coin denomination you have selected. The entire schedule of payouts is available by clicking on the button that says "View Payout" which is on the front interface. You may have to look a little to find it, but it is there, next to the "Monster Mania" logo. when you get there, all the appropriate tables are in front of you. There is no mistaking what the wild symbol is. It's the "Monster Wild," and it substitutes for any other symbol (except for the scatter!) when it comes to putting together winning combinations. naturally, since it only appears on three of the five reels, there is no jackpot available for five across on a payline. The Scatter Brain symbol does not need to appear on an enabled payline to win for you. Its effect is that it multiplies your winnings - the Scatter Brain payout times the total number of credits that are wagered. Interested in reading more detailed information about Monster Mania? If so Click Here for more details.